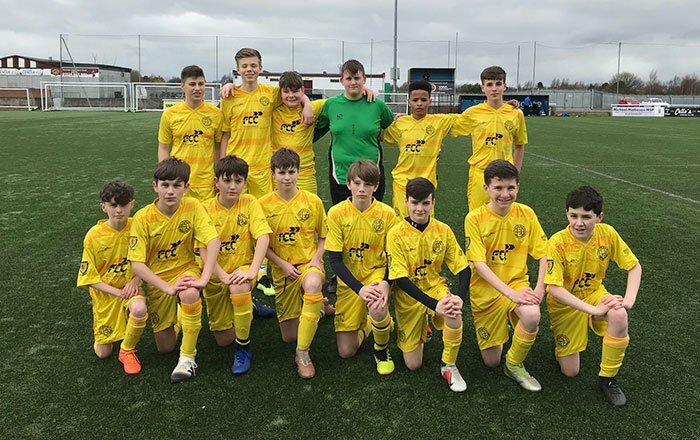 First up was the East Stirlingshire FC cup final at u 14 level with Dunblane HS and Graeme HS, Falkirk producing a thriller that went all the way to a penalty shoot out, eventually won by Graeme HS. Dunblane opened the game brightly and Graeme HS keeper Tom Kay gave an idea of the significant part that he would play in the game with a good save after only five minutes. Timam Scott for Graeme HS was causing early problems for Dunblane and Lewis O’Donnell was booked after only ten minutes for marking the dangerous Graeme wide man a bit too closely. O’Donnell was also prominent in attack as he led the Dunblane side in dominating play. Kay kept out a number of long range shots before with only a few minutes to go before half time, centre back Duncan Laird headed home from only Graeme’s second corner. Just before half time Laird showed his defensive qualities with a great block on Garcia- Clegg that kept the score line at 1-0 in favour of Graeme HS. Scott went close in the first minute of the second half then Kay made a double save to deny Talbot. Dunblane forwards shot over from good positions and it looked like a narrow 1-0 win for Graeme HS. However Dunblane kept going and with only a minute of normal time left Lewis O’Donnell smashed home from ten yards out, taking the game into a penalty shoot out. Dunblane keeper Cameron Garrido saved the first Graeme kick brilliantly and a successful first kick fromBen Jackson put them in the driving seat. Dunblane however missed their next two kicks with Kay saving one kick and the other hitting the post. Graeme High were ruthless from the spot and with Kay scoring with his penalty effort it meant that Timam Scott netting their fifth kick completed a 4-2 shoot out win that brought them the East Stirlingshire Cup. 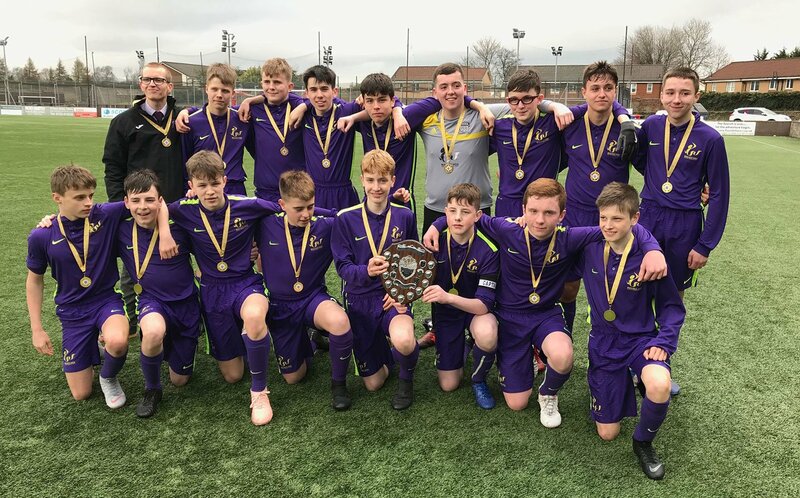 The under 15 Stenhousemuir Shield Final was between Wallace HS, Stirling and Grangemouth HS. Grangemouth had secured the League Play off Championship earlier in February but they found themselves a goal down after only 10 minutes. Wallace High School’s Gavin Hamilton flighted a superb 18 yard free kick perfectly to the top corner to give his side the lead. Only a further seven minutes had passed when a mistake in the Grangemouth defence presented Spencer Moreland with a chance which he gratefully accepted to give Wallace a 2-0 lead. Just before half time Grangemouth’s Kyle Neish had half chance but the same player scored after two minutes of the second half to put his side back in the game. Within five minutes Ross Goodwillie netted for Wallace to restore their two goal lead. In a ding dong affair Grangemouth hit back when Cameron Shaw found the net from 15 yards out to again reduce the Wallace High lead. In the 18th minute of the second half Grangemouth fought their way level when Craig Binnie headed home at the back post. With just over ten minutes to play it was ‘ game on’ as both sides searched for a winner. The winning goal did arrive for Wallace when forward Ross Goodwillie was tackled in the box. Referee Fraser McKay correctly awarded a penalty and Murray Kerr stepped up confidently to hit home the spot kick which proved to be the winning goal. FVSFA President Dave Eccles thanked all involved in such a thrilling cup final before presenting Wallace HS with the Stenhousemuir Shield. The u 15 girls competition for the Stirling Albion Cup will take place after Easter as will two SSFA finals involving FVSFA teams. Graeme HS seniors will play St John’s HS, Dundee in the Senior Shield Final at Hampden on 26th April. In early May the final of the SSFA National U 15 Trophy will see Forth Valley play against West Lothian SFA. The final arrangements have still to be confirmed.